LOS ANGELES — Abbyson has partnered with Canadian retailer The Brick to offer an exclusive furniture line, a move that plays to the retailer’s efforts to appeal more to younger consumers. The upholstery and case goods supplier said the collaboration is possible thanks to Abbyson’s recent infrastructure expansion that doubled manufacturing capacity and allowed dedicated production lines to key strategic partners. 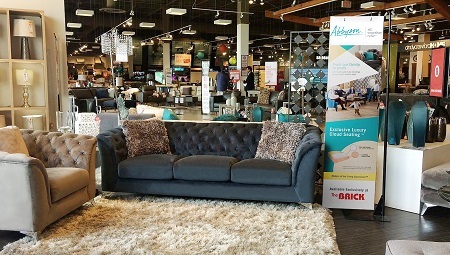 Since December, the more than 220-store retailer has featured exclusive Abbyson products in 122 showrooms locations — about 90% of its corporate stores. Eventually each store will have up to 800 square feet of dedicated Abbyson vignettes, said Doug Allen, senior director of merchandising for The Brick. In-store signage will be added in August. Currently The Brick is offering five Abbyson upholstery groups and one genuine leather accent chair, he added. “As The Brick customers mature, we consistently strive to attract younger customers to our stores,” added Gary Blake, director of merchandising for The Brick. Similarly, The Brick, a division of Toronto-based Leon’s, announced a partnership with Coaster in April to become Canada’s exclusive retailer for the Scott Living furniture line, dedicating about 1,000 square feet in its corporate stores to the collection. That move was part of an effort to build on a relationship The Brick already enjoyed with the Canadian-born Scott brothers but was also part of larger effort to seek new furniture branding opportunities and to tweak its merchandising to appeal more to younger consumers. “Abbyson is very proud to partner with The Brick and align strategically in a long-term partnership,” Abbyson Senior Vice President Rodd Rafieha said in a release. Abbyson products currently sold by The Brick include stationary sofas, a sectional and accent chairs, and the retailer soon will be carrying Abbyson power motion groups, too.